Starring: Chiwetel Ejiofor, Casey Affleck, Anthony Mackie, Woody Harrelson, Aaron Paul, Kate Winslet, Gal Gadot, Norman Redus, and more. Crime-thriller movies are few and far between these days and heist movies are so coveted to some film fans that it becomes a touchy subject as to when one is great or when one is just mediocre. With a history of great heist flicks like ‘Ocean’s Eleven’, ‘Reservoir Dogs’, ‘Heat’, ‘The Italian Job’, and many more; we await another to place among these ranks. Hoping to be a part of such a list, John Hillcoat presents the world with his latest crime-thriller film, ‘Triple 9’. Released in theaters on February 26, 2016, ‘Triple 9’ has had its guns blazing in hopes of enticing the audiences to love this crime-thriller new release. ‘Triple 9’ follows a group consisting of criminals and dirty cops as they pull off a string of heists at the command of a Russian mob. This group of secret criminals are Michael (Chiwetel Ejiofor), Marcus (Anthony Mackie), Gabe (Aaron Paul), Franco (Clifton Collins Jr.), and Russell (Norman Reedus). As these mob runners do the every whim of mob boss, Irina Vlaslov (Kate Winslet), she has them do even more difficult heists as time expires and she then requires a little more “motivation” out of the group and specifically leader, Michael. So she takes extreme measures to make sure the runners are going to do her bidding or else she will have each of them killed one by one, classic mob-style. As the film proceeds; twists are presented, egos are tested, and honor is challenged. 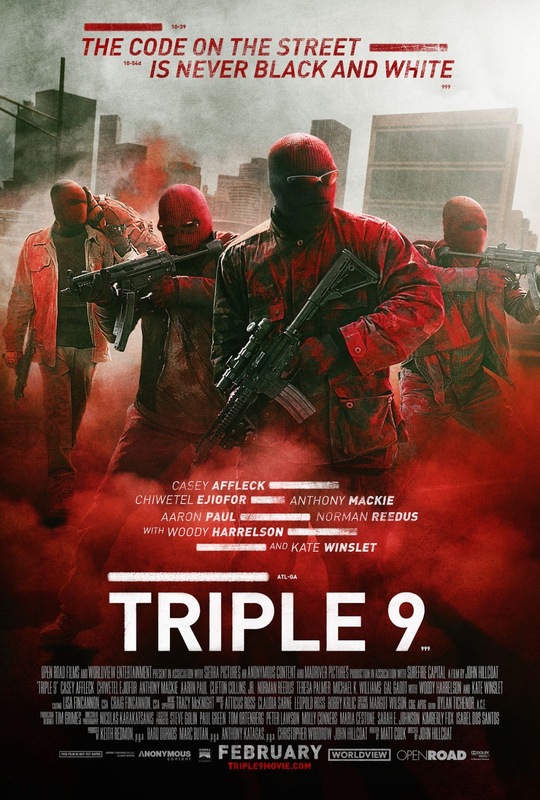 ‘Triple 9’ gives the audience an intense ride in regards to its consistent action sequences and its developing plot. I am at a split when it comes to ‘Triple 9’. On one end, there were few moments where I did enjoy the film. The actors are powerhouses and did what they could with the material given to them. Some plot points were interesting to me and had my attention and lastly, I am sure there is a certain symbolism behind the constant use of the color red that is shown in a high majority of scenes. On the other end, however, there was way too much I did not enjoy. From start to finish, I hardly understood any of the characters connections to anyone. They are explained in as little detail as possible. It just was not my cup of tea as far as understanding who the characters were and what was their purpose. Kate Winslet was absolutely atrocious to me. From her seemingly forced role to her forgetful “Russian accent” as she seemed to forget she was Russian at times speaking perfect English and bouncing back to an “accent”. The fan-favorite star power of Norman Reedus, Aaron Paul, Chiwetel Ejiofor and company was no where near enough to save this movie and draw enough of a crowd to make this movie even mistakenly good. Too many negatives and not enough positives. This movie is forgetful to me and nothing special. A few moments do not make up for a near two hours of confusion and plot holes.